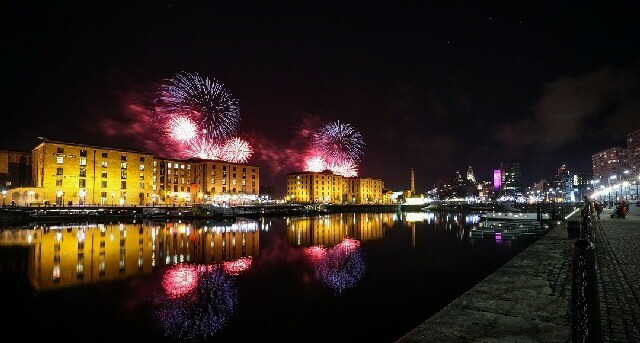 FIREWORKS will light up the Mersey on Sunday as the River of Light spectacular returns to the Liverpool and Wirral waterfronts. Here is your guide to everything you need to know about the event on the Liverpool side of the water. What is River of Light? ► Now in its 3rd year, River of Light is a specially commissioned display by Liverpool City Council and Wirral Council which takes place over the River Mersey. The fireworks are set off from huge barges on the water. Last year it attracted crowds of 110,000 and brought in ₤1.5m to the local economy. ► Yes. Liverpool City Council is proud to stage a number of free, crowd pulling major events each year. ► This year's event will act as the finale for the China Dream season, part of the City's 2018 cultural programme, so several art installations will be in place which represent the 5 Chinese elements; wood (based in Mann Island basin), earth (projections on the Royal Liver Building), metal (Leeds Liverpool Canal, on the Pier Head), water (the pavement outside Royal Albert Dock Liverpool) and fire (the fireworks display). ► The main event takes place on Sunday 4 November, with family activities starting from 4pm until 6.30pm, with the main display from 6.30pm. People will be able to see the art installations representing the elements from Friday 2 to Sunday 4 November, form 4.30pm to 10pm each night. When and where is the pre-show entertainment? ► The family friendly programme starts from 4pm at Mann Island where there will be face painting, lantern making workshops and creative paper folding crafts. Fiery performances will kick-off in Williamson Square from 4.30pm, courtesy of Bring the Fire, and will then take over the Mann Island basin from 5pm. Also from 4.30pm, expect entertainment on the Royal Albert Dock Liverpool courtesy of a fire breathing dragon patrolling the waters, and on Princes Parade there will be fiery puppets and a colourful walkabout by the Lantern Company. Why isn't it on 5 November? ► This is a major event, and as large crowd numbers are expected, road closures will be in place. Due to the disruption caused when closing part of The Strand, the decision was made to hold the event on Sunday, and therefore won't impact on people travelling on Monday. Who is responsible for the fireworks display? ► Titanium Fireworks manage the display and who are renowned as 1 of the leading fireworks companies in Europe. They are the team behind acclaimed national events including the Mayor of London's New Year's Eve party, Edinburgh's Hogmanay, the launch of Hull's City of Culture year and the opening ceremony for the 2014 Commonwealth Games in Glasgow. ► Yes, there is a synchronised soundtrack to the display, and some of the songs are in tribute to the Chinese elements theme; so expect Titanium by David Guetta ft Sia (metal), Adele's Water Under the bridge (water), Taylor Swift's Out of the Woods (wood) and Michael Jackson's Earth Song (earth). ► For Liverpool, head to the waterfront; in and around the Pier Head, Riverside Walkway and Princes Parade. ► For Wirral fireworks, please head to the display at New Brighton near to Fort Perch Rock. ► Alternatively head to:- RiverOfLightFrieworks.Co.UK for an interactive map showing locations of the animation and the best viewing areas. ► There are a limited number of spaces in the Museum of Liverpool for those with accessibility requirements. Any of those wishing to use this facility need to collect a wristband from the Tourist Information Unit located on the Pier Head. This is on a strictly 1st come, 1st served basis. ► There are concessions in front of the 3 Graces on the Pier Head, on Princes Parade and a small number at Royal Albert Dock Liverpool. They will include:- hot drinks, burgers, pizzas and street food. ► Due to the nature of the event, there will be road closures on 4 November 2018. ► Closures will take place between 8am to 8pm on:- Canada Boulevard, Brunswick St, Water St and St Nicholas Place. Mann Island will also be closed at its junction with Georges Dock Way. ► Closures will take place between 5pm to 8pm on:- The Strand, Goree, Strand Street, Albert Dock entrance, Gower Street, Kings Parade and Princes Parade will be closed from the junction of William Jessop Way up to St Nicholas Place. ► Liverpool 1 Car Park will be accessible and there will also be access for residents and businesses where and when possible. ► For tips on planning your journey, head to:- CultureLiverpool.Co.UK. ► Head to:- RiverOfLightFrieworks.Co.UK or join in the conversation on Culture Liverpool's Facebook and Twitter pages. The survey of almost 55,000 employers, placed Hugh Baird College as the highest ranking Further Education College in the UK with an employer satisfaction score of 99.2%, as reported by the research carried out by the Government's Education and Skills Funding Agency. Hugh Baird College is 1 of the largest training providers in the Liverpool City Region and has a long history of supporting employers of all sizes thanks to offering an extensive range of qualifications in a broad range of subject areas. Director of Business Engagement, at the Bootle based College, Lynn Masterton said:- "The Business Development team currently work with over 400 businesses across the Liverpool City Region. We offer advice on apprenticeships, training and funding opportunities that help businesses to develop the skills of their workforce further. In addition, we provide the comprehensive ongoing support that employers tell us they value." Yana Williams, Principal and Chief Executive at Hugh Baird College, said:- "We have spent the last 2 years reviewing the way we work with employers. We've listened to what businesses want from us and have tailored our offer, support and approach accordingly. We've enhanced the way we communicate with employers and have launched an online Employer Portal that enables employers to monitor the development and progress of their staff. We've also adopted a more holistic approach to the advice and guidance we provide our employers. This means that we talk to employers about the broad range of qualifications we can provide from all areas of the College, in order to develop and upskill their workforce. As an organisation, from a business to business perspective, our goal is to provide employers with the support and customer service they deserve. The results of this survey demonstrate that, thanks to working in collaboration and listening to the business community, we are achieving this goal. Strategically, we are aware of our responsibility to the development of the Liverpool City Region's workforce. We are fully committed to working closely with the Liverpool Local Enterprise Partnership and the Combined Authority in order to achieve the objectives set out in their ambitious and forward-thinking Skills Strategy." Ruth Dawson, Head of Learning, Education and Organisational Development at Liverpool Heart and Chest Hospital NHS Foundation Trust, said:- "On behalf of the Trust, I would like to wholeheartedly congratulate the team at Hugh Baird College on topping this national survey on employer satisfaction levels. As an organisation, we are certainly very happy with the relationship that has developed by working in partnership with Hugh Baird College. We work together on a broad range of training initiatives that benefit our workforce. Most recently we have launched an innovative traineeship training scheme aimed at helping get people in to employment at the Trust. Communication is clear and prompt and we envisage our partnership going from strength to strength." Human Resources Business Partner at CMA CGM Group, Claire Brownrigg, said:- "I would like to congratulate the team at Hugh Baird College. In our opinion, it is thoroughly deserved. Hugh Baird College have provided an excellent range of courses for our employees such as Business Administration and Customer Service apprenticeships. The feedback from our staff has always been positive and the communication with the College has been great. College representatives are always friendly and professional and they are always willing to assist with any queries." Sean Sephton of Sovini Group's Learning and Development Department, said:- "We have had a long standing relationship with Hugh Baird College and over the years they have supported us with our apprenticeship recruitment in many of our trade areas, as well as the recruitment of administration apprenticeships within our head office. On the introduction of the Apprenticeship Levy last year, we had regular meetings with the Manager of the Business Development Team who supported us during this change and provided us with essential training on the new systems introduced by the Government. We regularly access the College's Employer Portal to review our apprentices' attendance and College performance and we also benefit from monthly 'keep in touch' meetings with the Business Development Team Manager. On behalf of Sovini Group, I would like to congratulate Hugh Baird College on this outstanding achievement." Linda Riley, Salon Manager at Face Beauty, said:- "I would like to congratulate the apprenticeship department on this fantastic achievement. We have worked with Hugh Baird College for a number of years and the support we have received has been exceptional. The College undertake all the recruitment of apprentices for us and all of my apprentices have successfully passed their qualifications with many going on to successful careers in the industry. For me this is testament to the dedication of the learners and the support and training they receive from the team here at the Salon and at Hugh Baird College." Keith Carr, Contracts Manager at Miedan Electrical Contractors, added:- "News of the College topping this national survey does not come as a surprise to me. We have worked with the College for the last 2 years and we have always been very satisfied with the service we get from the Business Development Team. We receive regular communication from the staff and I also receive very positive feedback from the apprentices about the College facilities and the training they receive." For more information on how local businesses can work in partnership with Hugh Baird College, call the Business Development Team on:- 0151 353 4444 or alternatively visit:- HughBaird.AC.UK/Employers.